It’s the final showdown with Iymrith, the ancient blue dragon. The Yuan-ti lay dead at our feet. I raced over to Harshang and cut his metal bonds, while Bryseis ran over to the piles of gold coins, a glittering hoard worthy of an ancient dragon. “Has anyone seen Felgolos?” I called out. A gigantic serpentine head snaked out from the cascading sands behind us. The ancient blue dragon clenched its massive jaws around King Hekaton, who didn’t even have enough time to turn around. In an instant both dragon and giant disappeared beyond the veil. “Iymrith you coward!” I screamed. The epic showdown between an ancient blue dragon as finally upon us. First we had to engage in a brief dust-up with some Yuan-ti guards. As discovered at the end of last week’s session, some Yuan-ti were guarding the entrance to Iymrith’s treasure hoard through a waterfall made of sand. While we were deliberating on how best to approach them, TIM impatiently charged through the sand and got the party started. One by one we followed suit. The Yuan-ti were numerous, including Malisons and Purebloods, but they were no match for us in our Giant-size forms, plus our Storm Giant allies. 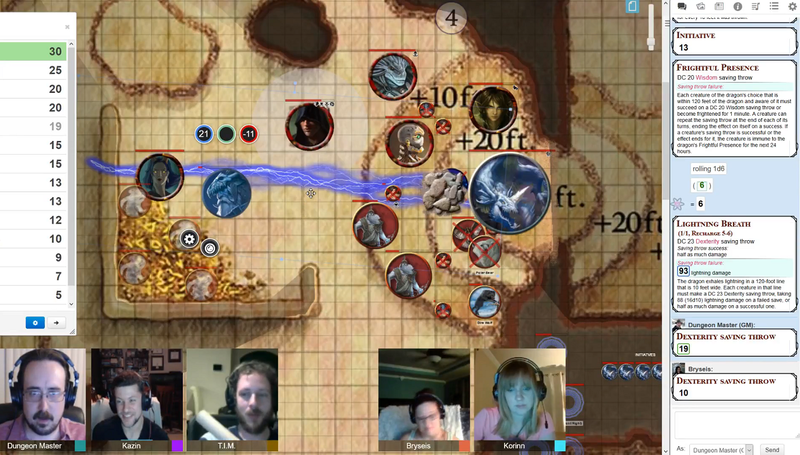 During the fight Iymrith taunted us, unseen, and at one point Felgolos let out a scream and never emerged through the sandfall to join us. We saw Harshnag bound and tortured in a corner and immediately freed him. After his noble sacrifice back at the Temple of the All-Father the dragon had kept him as a trophy of sorts. He was all too happy to get some revenge as he put on his armor, and Bryseis began greedily looting the dragon’s hoard of gold. Iymrith continued to taunt us, her voice bouncing off walls. Her giant head emerged form the other side of the sandfall, grabbed King Hekaton and pulled him in. I screamed at her that she was acting cowardly by hiding and picking us off one by one (in truth it was brutally effective). One CHA check later and she responded by joining the fight properly. Boss battle time! Our DM had a really nifty technique for this fight. He divided up all of the Ancient Blue Dragon’s various attacks and actions into multiple hit point zones and Initiative rolls, creating one of those video game boss battles where you can attack and disable certain body parts. Unfortunately we couldn’t even get close to her for the first few rounds. She buried Kazin in an avalanche of rocks, conjured a sandstorm to blind Korinn and TIM, and used her Frightful Presence to make almost all of us Frightened of her for most of the battle. Then we felt the sting of her Lightning Breath. 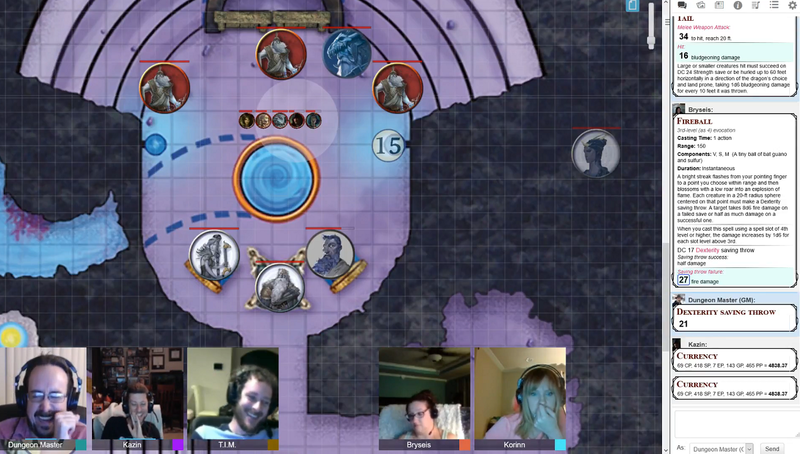 First 88 damage, then 95 damage which the DM blessedly passed around the party (that 95 damage nearly took out Bryseis in one hit – even with our doubled HP from the Giant Potion). Hekaton emerged to join the fight on the second round, thankfully, though the two other storm giants actually turned on each other, one of them having been manipulated by Iymrith. A sleeper agent in our midst! I had Kazin use Suggestion on the turncoat storm giant to force him to return to our side. We needed those giants attacking the dragon! 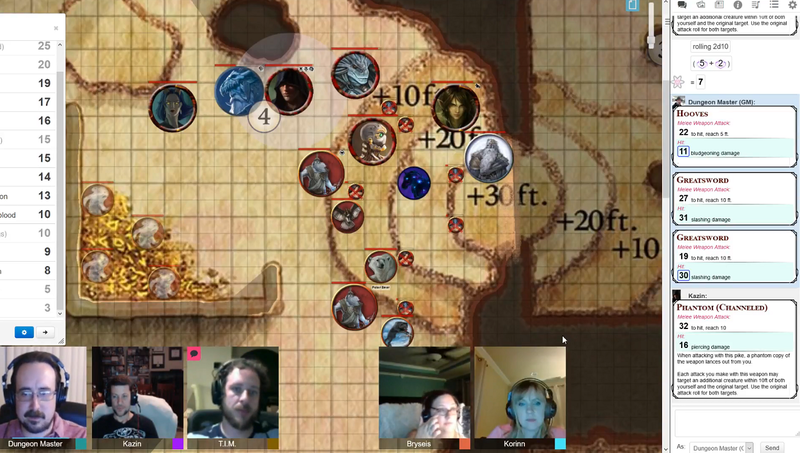 From there we slowly clawed our back from disaster, trying to make the harsh saves and using Bryseis’ summoned animals to tank much of her damage each round. One highlight was Bryseis using Animated Objects on the boulders that had trapped me for the first round, turning them into a useful little attack force. Once we disabled her lightning breath and at least got un-blinded things slowly shifted in our favor as we were able to attack her directly. One of the storm giants went down, and I was slowly reduced to about 1/4 of my hit points, which were over 200 thanks to the Potion of Giant-size. But we were doing some really great damage to her. The giants alone were easily capable of hitting for 30 damage with each attack, and they could attack twice. Korinn threw a ringed Wall of Fire right on top of her and Bryseis pummeled her with Fireballs until finally she screamed her least, and toppled to the ground. We snatched the scepter from her body and Hekaton teleported us back to the Maelstrom, remembering that we needed to save his daughter with it. Kazin extradited Atallia and returned to the Monastery of the Mind-Zei. They would rebuild it and continue to shelter and train those afflicted with psychic abilities. He would also spend much time researching the kraken Slarkrethel that had nearly wiped them out. Bryseis went to Waterdeep to find the money she had funneled to her mother’s gambling business had already created some lucrative business deals – by partnering with Miri Greycastle. Bryseis takes over the entire operation in Waterdeep, and gets to work becoming a top-dog within the Zhentarim. As the hero of her people, Korinn becomes the sole leader of the blue dragonborn. She puts down her sword (er, Chromatic Orb) and gets to work rebuilding her people and her society. By wielding both Dawn Guard and Dawn Strike, T.I.M. has become an archon of Lathander, a holy warrior and defender of the faith. While he adjusts to this role, he hears stories of wandering war-forged seemingly without purpose, now that Iymrith’s factory was destroyed. T.I.M. Halfred gets word that the stone giants that were attacking his homeland had retreated. His master, Wuce Bwyane, requested he return to take up the heroic efforts of the Wombatman. Harshnag joins them in their adventures. Next week we’ll spend our session recapping all of our year-plus long campaign of “Storm King’s Thunder,” and then we’ll announce our next campaign plans!